Is there a better alternative to FindFocus? Is FindFocus really the best app in Productivity category? Will FindFocus work good on macOS 10.13.4? FindFocus is a productivity and money making amplifier for people working online who are only getting paid for results. The software helps you to eliminate addictive zero dollar value activities like mindlessly browsing Facebook or watching videos by blocking distracting websites with automated schedules and replaces them with high value money making activities. For example you can run a blacklist containing distracting websites such as Facebook, Twitter, Reddit, or Hacker News during your working hours. At the same time, you can run a whitelist with your work tools and SaaS services to focus on your work. If you need to look up something, you would use one of the "soft unlocking options" (e.g., enter a motivational phrase to allow yourself to take a "Focus Pause" for 10 minutes to do your research). After 10 minutes are up, you are forced to continue to work because the whitelist kicks in again and all websites, except the tools and websites in your whitelist, are blocked automatically. Group your websites into categories to create a new sequence or block specific URLs in seconds. Create lists for social media sites, email, and work-related websites or games. Profile Descriptions: Keep the overview. Create powerful descriptions for every profile you create. White List Mode For Websites: Block only the websites that distract you while still being able to use any other site. Wildcard Syntax for Websites: Only want to use a certain part of a website or forum? We've got you covered: just block (or a allow) the part of the website you need. Black List Mode For Apps: Want to block your local email client or prevent yourself from playing games with Steam? No problem. Just choose the apps that waste your time. Pomodoro-Timer: Use your favourite time-management technique whether you like to work in blocks of 25 minutes and 5 minute breaks or 50 minute/10 minute or 43 minute/17 minute breaks. 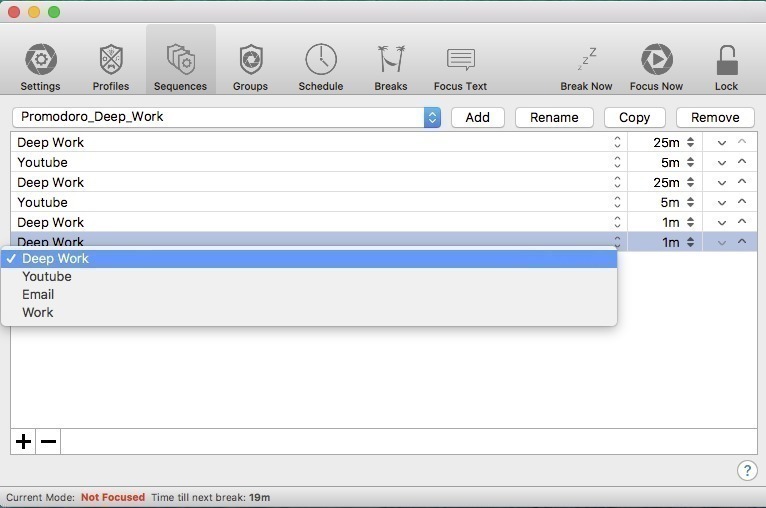 Automated Breaks: Remind yourself to take regular breaks by turning your screen black. Break Postponement: Just hit "Postpone" and delay your break without forgetting to take one. Break Enforcer: Don't procrastinate on what's good for you. The app will force you to take a break! 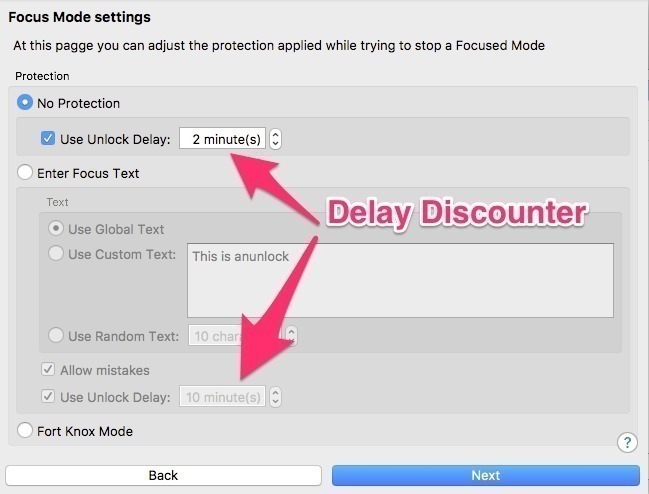 Delay Discounter: End your focus mode any time you want. Only catch: you have to wait a few minutes. Focus Text: Enter motivational text or a quote before you can unlock the app the focus mode. Random Character Protection: If entering text is too easy, let the software choose random characters (that you need to enter) in order to unlock FindFocus. "Fort Knox" Mode: You cannot quit the focus mode and have to continue working on your project. Focus Pause: Just pause your blocking session instead of quitting it for some quick research, or use it as a reward to go to Facebook, YouTube, or Reddit for a few minutes.